Christiana has overall 16 years of professional experience, She holds a BSc from the University of Cyprus in Public and Business Administration and a Master’s Degree in Management MSc Management from Surrey University in Great Britain. Christiana began her career in 1997 in Amer Nielsen Company where she worked for a year at the consumer research department. Main task was to plan, organize, coordinate and carry out market research. 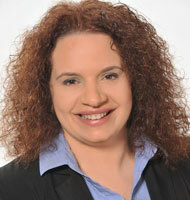 In November 1998 she joined the group HR Consulting at KPMG in Athens. In September 2000 she joined the team at KPMG Cyprus as Head of Human Resources Consulting Services, where for a period of 10 years was responsible for the development and effective operation of the department with direct view to providing high quality services. In July 2012 she joined the group Human Asset Ltd with responsibility for development of HR Advisory services. Christiana has professional experience in a wide range of issues related to HRM as Recruitment and Selection, Design Performance Systems, Reward and benefit systems, Development of HR strategy, L&D needs identification mechanism, Facilitation workshops, Training and Employee Satisfaction Surveys. She is Investors In People Certified Specialist.